A City Hall gadfly arrested after submitting a comment card containing Ku Klux Klan imagery, racial slurs and profanity during a meeting chaired by a black councilman will not be charged with any crimes, the District Attorney’s Office announced Thursday, December 22. The D.A.’s office cited Wayne Spindler’s First Amendment rights and insufficient evidence that he violated any of the threat statutes as reasons for not filing a criminal case. “There is no doubt the speaker card contained hateful and extremely outrageous words and imagery that we reject as being deeply offensive, morally wrong and socially reprehensible,” a D.A. charge evaluation worksheet on the case states. But there was insufficient evidence that Spindler crossed the “somewhat nebulous line between constitutionally protected free speech and punishable ‘true threat,’” the document says. 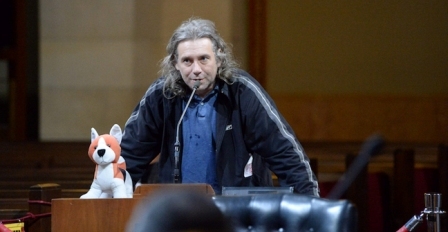 Spindler, 46, frequently speaks at Los Angeles City Council meetings, is critical of the government, and often holds a puppet while making vulgar comments. He was arrested May 13, two days after a committee meeting was held chaired by Council President Herb Wesson. Vanessa Rodriguez, a spokeswoman for Wesson, said he was disappointed by the outcome. Spindler could not be reached for comment. Wesson subsequently obtained a restraining order requiring Spindler to stay at least 10 yards away from him during council and committee meetings. Spindler can still attend the meetings and give public comment in a peaceful and orderly way. Spindler filed two claims in June against the city related to his arrest, alleging $775,000 in damages.